The collapse of the Second Narrows Bridge being built across Burrard Inlet on June 17, 1958, claimed nineteen lives. It remains the worst industrial accident in the history of Vancouver. Since 1994, the collapse has been remembered by renaming the bridge the Ironworkers Memorial Second Narrows Crossing. Two plaques are located at the south end of the Ironworkers Memorial Second Narrows Crossing, northbound side. Jamieson, Eric. 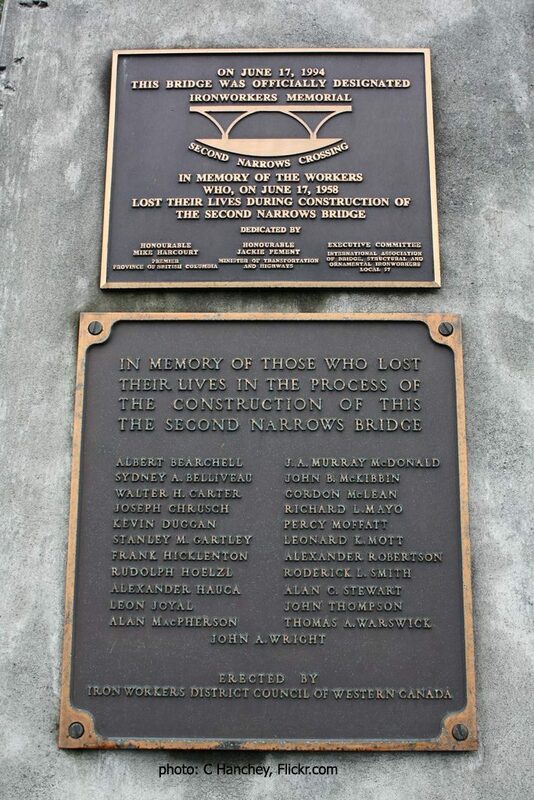 Tragedy at Second Narrows: The Story of the Ironworkers Memorial Bridge, Madeira Park: Harbour Publishing, 2008.